Our Council is very proud to have a wealth of talented artisans producing some of the loveliest and finest gem and lapidary works in New South Wales and the ACT. This page provides a directory for people seeking to make contact with their local gem and lapidary club. AFLACA – Australian Federation of Lapidary & Allied Crafts Associations Inc. Tuition: Our club offers tuition for both juniors and seniors in all aspects of lapidary and allied crafts. Fees: Joining fees are family $10, adult $5, junior (under 16) $2. Annual fees are family $25, adult $15 and junior $5. Saturday (commencing Jan 2018) 9am – 12Noon. Fees: Approximately $20 per family per year plus $5.00 insurance per person. Daily Workshop attendance fees are $2 per session. Tuition: We teach silversmithing and casting, cabochon cutting, faceting, beadwork and jewellery making. Monthly: Jewellery Workshop classes are conducted on a Saturday and cost depends on project. Field Trips: Held during the year in school holidays. General: Social activities include Open days, Christmas Party and Outings. Canberra Gem Shows: Please see club website. Central Coast Lapidary Club Inc.
Activities: Faceting, cabbing, silverwork, enamelling, beading plus special workshops for casting, bone & gem carving and wire wrapping. Club Hours: Members meet in the club rooms each Saturday from 10am until around 4pm, and each Thursday from 12pm until around 5pm. Please follow us on Facebook: Glen Innes Mineral & Gem Club Inc.
Goulburn Gem & Lapidary Club Inc.
Meeting and Membership Details: The Club House is open Monday and Friday from 10.30 am to 4.30 pm. Closed on public holidays. Beginners’ Class is on Wednesdays 4 pm to 6 pm. Daily Fees are $5 per day per person. We have juniors from 12 years. Membership Fees including insurance are as follows. Singles $25.00, Couples $35.00, Family $35.00, Junior $5.00. Beginners’ Class 5 week block to be paid in advance $15.00 plus membership for juniors and seniors. All new and old members welcome! Visits: Come and see us when we are open. Grafton Gem Club meets at our clubrooms in the Grafton Showgrounds. Sessions are held on Tuesdays and Saturdays from 9am to 3pm and also on Thursday evenings from 4pm to 8pm. Anyone is welcome to join however junior members must be over 12 years old and must be accompanied by an adult. Club Activities: Wire Wrapping Classes, Silver Rings And Findings Classes, Gem Tree And Jewellery Class, Grinding, Shaping And Polishing Gemstones , Faceting Classes (Wednesday Night), Collecting Mineral And Fossils, Fossicking Trips. Fees – Annual Membership : $20 – Single (over 18yrs), $48 – Family (2 Adults & 2 Children under 18yrs), $15 – Junior (16-18yrs), $10 – Sub-Junior (9-16yrs), $15 – Concession, $30 – Concession Family. Any new member pays the Annual Fee as per the quarter of the year in which they join plus the Joining Fee. If joining in February the Annual Fee will be pro rata 6 months plus the Joining Fee. Open Day, always in the second half of the year. Annual Gem and Mineral Auction, always in the first half of the year. Please see website for annual dates and details. Annual Fees: Adults $45, Pensioners & concession card holders $25. Joining fee $5. Open Day: Second weekend in April. Annual Show: Fourth weekend in October. The club is one of the longest established clubs in country NSW, having been going for more than 50 years. A full range of lapidary activities is offered at the club workshops and regular fossicking trips are organised. 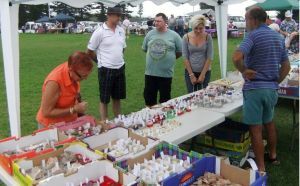 GEMFEST Show: In May each year the club runs GEMFEST, held on the weekend following Mothers’ Day each year. Meets every Saturday 10 am till 4 pm in the Grandstand Pavilion beneath the Grand Stand at Wingham Showground on the Gloucester Road. Our club was formed in 2009 and has around 50 members. We have a well equipped workshop with everything a lapidary enthusiast could want. We teach faceting and cabbing to beginners, have some great fossicking adventures locally and away, and have an impressive Gem and Mineral Museum open to the general public every Saturday. Meetings: The The Mineralogical Society of New South Wales Inc. meets at the School of Natural Science, University of Western Sydney, Parramatta (North) Campus. This map provides the directions to the meeting place and parking details. Note that there are two sections to the Campus. The School of Natural Science is on the north side of Victoria Road. It can only be entered from Pemberton Street. Meetings are usually held in room LZG 14, which is on the ground floor. At times it may be necessary to make a room change so always check the Newsletter for confirmation. Meetings are held on the first Friday of all months except when the first Friday falls on a holiday weekend, in which case the meeting is postponed to the following Friday. Jim Sharpe (02) 9871 2502. Library: The Society maintains an extensive library of mineralogical and earth-science-related books for borrowing by members and also subscribes to a selection of the leading mineralogical magazines. Fees: Single $22.00 (plus $7 joining fee); Couple $34.00 (plus $10 joining fee); Family $39.00 (plus $10 joining fee); Junior(12-16yrs) $12.00 (plus $6 joining fee). Tuition: We teach silversmithing and casting, cabochon cutting and polishing, faceting, beadwork and jewellery making. Street Address: cnr Gordon Street and Lake Road, Port Macquarie. The Lapidary Group presently meets on Wednesdays from 9am for Silver Jewellery, and on Thursdays from 9 am for General Lapidary, including Faceting and Cabbing. Visitors and new members are always welcome. Port Hacking Lapidary Club Inc.
Workshop hours: Tuesday 9am – 1pm; Thursday 6.30pm – 9pm; and Saturday 9am – 12.30pm. Fees: $23 per year, Concession $15: Joining $10, Family $15: $3 per session (half day) at clubrooms. Tuition: Cutting and polishing cabochons, faceting, gem trees, dichroic glass, enamelling, casting and silver jewellery.